Do you get hypertensive thinking about blood pressure (BP) in your patients? With the advent of handheld and cost-effective technologies, blood pressure monitoring has become part of the minimum baseline data for many veterinary patients, especially in the ER and ICU. Obtaining blood pressure values can be a simple task. Making sure those values are accurate and knowing what those numbers mean can be equally challenging. Blood pressure is the product of systemic vascular resistance (SVR) and cardiac output (CO) and the driving force behind tissue oxygenation. While direct arterial blood pressure (DABP) measurement is considered the gold standard, it is technically demanding, as it requires placement of an arterial catheter and the use of a transducer and monitor. Moreover, in veterinary patients, Korotkoff sounds are inaudible. This is why you don't see many veterinarians walking around placing their stethoscopes on the arms of dogs and listening carefully. It is either that or all the panting would get in the way of a good reading! For this reason, indirect blood pressure monitoring is more common in clinical practice. Indirect blood pressure monitoring is commonly peformed, using either a Doppler or an oscillometric monitor. The doppler technique uses a crystal to detect flow instead of a stethoscope. Using this technique, ultrasound gel is placed on the crystal surface. The gel and crystal are then placed distal to the cuff over the artery. The crystal converts the pulsatile flow signal to an audible sound delivered via the doppler speaker. A pressure cuff is used to occlude the artery, with the assistance of a sphygmomanometer. The pressure cuff is inflated to a pressure greater than that of the blood pressure, at which time the audible sound of the pulsitile flow is lost. The pressure in the cuff is then slowly released. The pressure at which the audiblble flow signal returns is considered the systolic blood pressure. A doppler blood pressure is obtained with the use of a crystal, placed over the artery distal to the cuff. The reading at which the pulse is again audible is considered the systolic blood pressure. In cats, values obtained may be closer to the mean arterial pressure (MAP) based on more recent literature. Oscillometric blood pressure monitoring is slightly more advanced. In this method, the cuff is placed around a limb or the tail over an artery and connected to the monitor. As the cuff inflates and deflates, oscillation of the arterial pulse in the cuff is detected electronically. 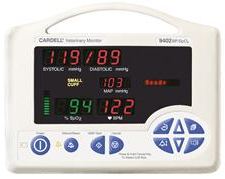 The monitor then calculates and displays the heart rate, systolic BP, diastolic BP, and MAP. Regardless of which method you use, it's important to accurately place the cuff on the patient. 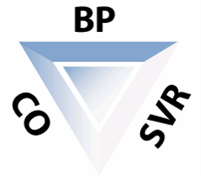 The most common errors in measuring BP are related to cuff selection. That's right... it all boils down to that $5 plastic cuff! The cuff is placed around the limb or tail, over the artery, with the width of the cuff covering 40% of the circumference of the limb that is being used for the measurement. A cuff that is too large will falsely decrease the BP, and a cuff that is too small will falsely elevate the BP reading. When in doubt, make sure to monitor BP frequently in patients where you have concerns about hypo- or hypertension. Most importantly, make sure you're using the appropriate technique (e.g., cuff size) when taking a BP! It’s interesting that the most common errors that occur when measuring a patient’s blood pressure have to do with proper cuff selection. Even with the more advanced method of oscillometric BP monitoring, it makes sense that an incorrectly sized cuff could result in incorrect information being sent to the monitor. 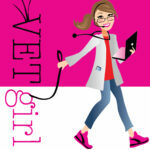 I learned a lot about blood pressure in veterinary medicine, so thanks for sharing this article! Can you recommend a reliable, reasonably priced veterinary blood pressure monitor for clients to use at home? I wouldn’t recommend having a pet owner do it unless they are in the medical field.